Compare hotels to find the cheapest rooms for your week of skiing! On our site, you can compare all of the offers on available rooms. Each offer is shown by the price of a week-long stay, to make sure you receive the best deals. 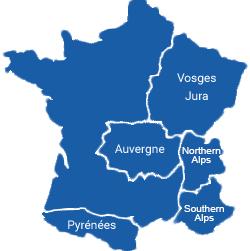 We offer you a wide range of holidays within French ski resorts. For example, the search criteria of the site can help you to find a hotel room for a ski holiday by the slopes or a hotel room with an on-site childrens club. And with just one click, you can compare multiple resorts at once depending on your needs. Choose a hotel in a well known ski resort or find one in a mountain village that will allow you to enjoy the snow! There are many leisure activities on offer to enjoy after your day of skiing, furthermore, the equipment provided is available at an excellent price, the ski resorts we offer are the most popular and well-renowned in France.